An update regarding the Water we use in Wests' Products. Following todays news from the Dunedin City Council, we can confirm that our water is sourced from OUTSIDE their risk area, and as a result has not been impacted. Further, as part of our Food Safety Management System, all the water used in our products is put through additional Carbon Filtration as well as Ultra Violet treatment to ensure its safety & guarantee its quality. We have already assisted impacted customers by providing our bottled water, and stand ready to further assist as requested by the authorities. We're excited to announce Wests' latest competition. 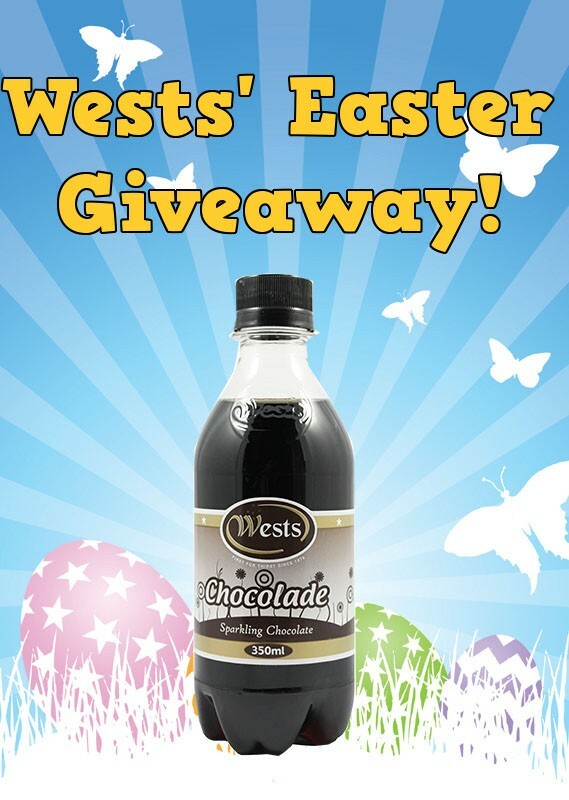 In following with the traditional Easter Celebrations accompanied with Chocolate Easter Eggs - Wests has followed suit with a national giveaway of our Chocolade drink! Limited strictly to our Social Media channels, we're offering the chance for you & a friend to each win a BOX of our 24 packs of 350mL Chocolade (Or assorted 350mL flavours) delivered straight to your doors, anywhere throughout New Zealand! Simply follow Wests and tag your friend below our repective Social Media posts to be in to win! This competition closes on the Midnight following Easter Monday (April 17th) so get in quick. Winners are to be selected via Random number generator within 5 days of closing, so the more seperate comments & Tags you make, the greater your chances of winning. The product/service that is being given away will be outlined on the individual post. No alternatives are offered and the produce/service cannot be exchanged for cash. The competition closes at 12:00 a.m on Tuesday 17th April. No later entries will be accepted. If you enter the giveaway via Facebook, Instagram or Twitter you agree to complete release, and you recognise that the giveaway is in no way sponsored, endorsed, administered or associated with Facebook, Instagram or Twitter. If you win you will be contacted via Private message though the Social Media channel that you use to enter the giveaway. We will contact the winner within 5 days of the closing date of the giveaway. The winner will have 7 days from this date to respond. If we do not hear from you within this time another winner will be randomly drawn. Over the last few months, we have gradually phased out and replaced the Artificial Sweetener used in our Sugar Free products. Previously using Aspartame, we have reviewed feedback from customers, and subsequently replaced this with Sucralose going forward. Although it must be clarified that Aspartame is an approved sweetener for use in beverages by New Zealand as well as International Regulatory Agencies, it has carried a negative perception from critics and health groups. As such, we made the decision to replace this ingredient in our Sugar Free products and have replaced it with Sucralose. Also widely researched as well as internationally approved as safe for human consumption, Sucralose carries less of the negative connotations of Aspartame and has additionally been taken up more and more by food producers as their primary artificial sweetener. Further, it manages to retain its sweetness longer than Aspartame which degrades at a quicker rate over time comparatively. 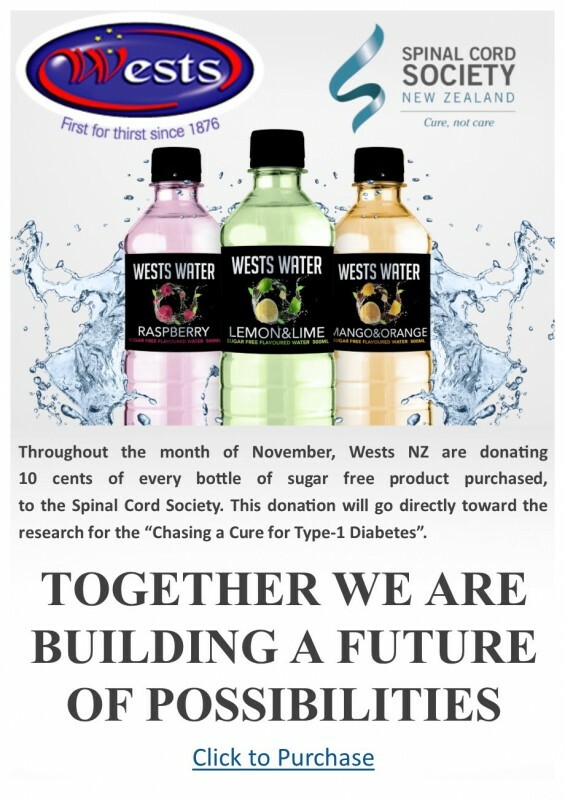 Wests are proud to announce our Sponsorship of the great team at Spinal Cord Society of New Zealand during the month of November. Looking to clarify following today's media articles regarding the outcome of Wests' Liquor License Appeal. We are obviously disappointed in the outcome of the decision, however realistic that after two years it is difficult for a small business to continue an already prolonged legal fight against such well resourced opponents. This has been an especially stressful period for Alf & Kaye, who have managed to personally juggle hearings and meetings alongside the day-to-day requirements of running the business. They are however extremely grateful for the outpouring of public support received during this time. We have always prided our shop & Wests as a whole on friendly and responsible service, and it was humbling to see the community rally behind us in this fight.